"Die Uhrzeit" (the time of the day). 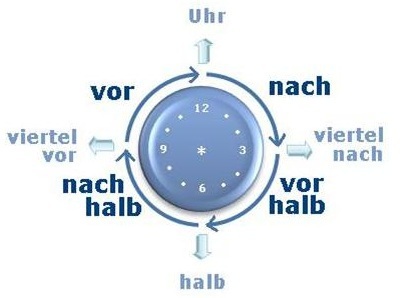 How to say the time in English and German. 7:00 h. -sieben Uhr 7 A.M.
Um wie viel Uhr beginnt der Unterricht? Um 9 Uhr. At what time does the class start? At 9. Wie lange dauert der Unterricht? Von wann bis wann haben wir Unterricht? From when to when do we have class? Heute ist der sechszehnte Mai.